The potato is a staple food in most parts of the world, and it's one of our most versatile vegetables. Boiled, mashed, baked or roasted, there are several ways to cook potatoes and an endless number of ingredients to combine them with to create a variety of recipes. For best results, choose potatoes by how you'll be using them. 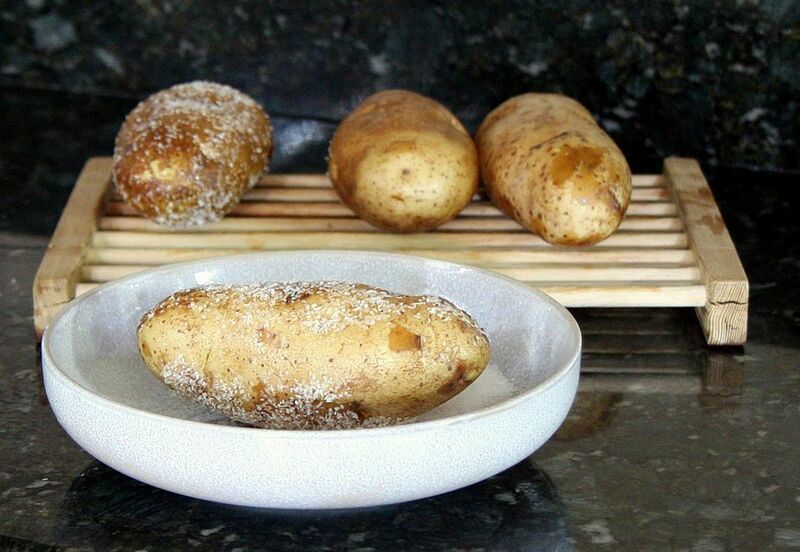 The russet, or Idaho, has a high starch content, making it ideal for frying or baking, while the similar long white potato, which has a medium starch content, can be boiled, baked or fried. Yukon gold and other yellow potatoes are low- to medium-starch potatoes, and are well suited to roasting, mashing, baked dishes, and soups and chowders. Round red and round white potatoes have less starch and more moisture, making them best for boiling, but they can also be roasted or fried. New potatoes are firm and waxy; they're excellent boiled or roasted, and hold their shape well in salads. For each type of cooking technique here are some tips for making your potato recipes easier and more delicious. Stand potatoes on end in muffin tins if you're baking several. For crispier skins, bake at 425 F for 45 to 60 minutes. Bake extra potatoes and use leftovers for hash browns the next day. Rub a little oil, butter or bacon drippings on potatoes before baking for crispier skins. Cut leftover baked potatoes into 1/2-inch pieces and brush with olive oil and seasonings. Bake at 425 F, turning occasionally, for about 35 to 45 minutes. Cut leftover skins into strips and brush with olive oil. Bake at 400 F for about 10 minutes, until crispy. Season to taste and use as a snack with dip or crumble into soups or salad. Top baked potatoes with chili, cheese, sour cream, light cream cheese and chives, vegetables and cheese sauce, chicken a la king, spaghetti sauce, pizza toppings, etc. Allow 1 potato per person when making French fries. After cutting potatoes, soak in cold water for at least 30 minutes. Dry potatoes thoroughly before frying. After frying, drain fries on a double layer of paper towels and keep warm in a low (250 F) oven while frying the remainder. For crispier fries, fry twice. First, fry them until golden in 340 F oil, then drain and let cool at room temperature. Just before serving, fry in 375 F oil in batches until golden brown; transfer to paper towel-lined baking sheets and keep in warm in a low oven while frying the rest. Cook the potatoes in milk for extra richness. Cook the potatoes with several peeled garlic cloves, then mash with garlic as usual. Use baked potatoes for mashed potatoes instead of boiled. Add evaporated skim milk instead of whole milk. For lighter mashed potatoes, beat in more milk and leave out the butter. Don't overbeat - overbeating can cause starchy, sticky mashed potatoes. Use leftover mashed potatoes to thicken soups and sauces, or form into patties, dip in beaten egg and breadcrumbs, refrigerate for an hour and fry until crispy. Beat in herbs, seasonings, roasted garlic, minced vegetables, or grated cheese for added flavor and color. Toss potatoes (small halved or medium to large ones cut into quarters or eighths) in olive oil, or a melted butter and oil combination. Roast for 1 to 1 1/2 hours in a preheated 375 F oven, or until golden brown outside and fork-tender inside. Turn often for uniform browning and crispness. Use pan drippings, bacon drippings or lard for extra flavor.